A Dutch company is the first in the world to build a prefab house of a variety of the Cannabis plant. Benefits of the plant based house should be durability, high isolation capability, earth-quake resistance and affordability. World’s first Cannabis house is located about 250 kilometers away from Cannabis Valhalla, Amsterdam, the Netherlands. To build the house, the Cannabis is mixed with water and glue to “hemp concrete”, also known as “hempcrete”. Hemp is the name of a variety of the Cannabis plant that is grown for industrial use. With hemp, it’s possible to make paper, clothes bio fuel and even food. Unlike the well-known Cannabis to get high, the industrial Cannabis doesn’t contain sufficient concentrations of psychoactive components to alter state of mind. In the Northern of the Netherlands, where traditionally mainly potatoes and beetroot was grown, hemp has become an additional source of income for farmers. The harvested hemp is processed to fibers and one of the companies that processes it, Dun Agro, has started production of what it calls, “hemp concrete”. This mixture of the woody core of hemp fibers, water and glue is pressed together in a mold to make prefab sections for houses. After three months of natural drying, the sections are ready and can be put in place. The first house that was built this way has now been completed and a second is under construction. 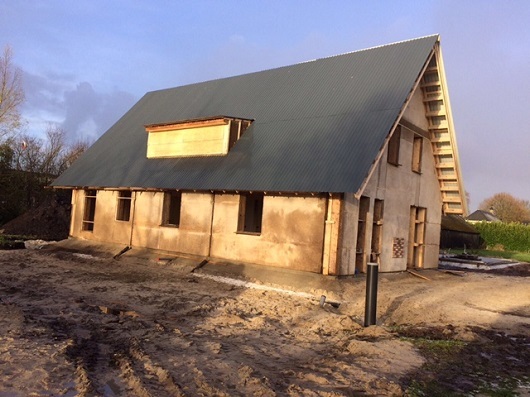 Both houses have their outside walls, interior wall and their roof made from the hempcrete sections. With the current 1,100 hectares of agricultural land used for hemp in the Netherlands, Dun Agro claims to be able to build 500 houses per year and easily scale up in case demand increases. On small scale there have been some initiatives to build houses from hemp. However, Dun Agro claims it’s the first to build a prefab house, which is a production method that it can quite easily scale. Hemp has been used before as it is considered an attractive building material, particularly thanks to its high isolation capability which results in lower energy consumption. Close to the area where the house has been developed there are regular earthquakes due to gas extraction, therefore the earth-quake resistance is another benefit emphasized by Dun Agro. Another benefit listed by the company is the negative CO2 footprint of Cannabis based houses, because the hemp takes on 13,500 kilos of CO2 when it grows. This CO2 remains stored in the hempcrete. Hemp is especially an interesting plant for farmers, it grows fast, needs little pesticides and fertilizer and its deep roots improve the grounds it grows on. It’s also an excellent intermediate crop, which means the plant can be used in between other crops and is therefore an additional source of revenue for the farmer.